I'm pumped for week after week of growing closer to the heavenly Father. It's a wonderful journey. As we grow closer to God we start to see the truth more clearly. We become progressively more moral. We become wiser. We become stronger. Our faith grows and flourishes. Our inner peace and serenity expands, so we can handle the most desperate situations calmly. Because one day soon, we may have to. I see God training a new generation of leaders, through the power of the internet. These men and women have access to a wealth of information on politics, news, science, and religion. These people have the need for truth, and desperately seek the truth. And eventually they find the road leading to the holy Bible. They come for the word of God, because they see an awful world around them. The truth sets us free, inwardly. When we are free inwardly, we seek to make our external world better. We seek for true liberty of surroundings. And it's nice being free isn't it? Our freedom may be taken away externally, but internally we find freedom from sinful obsession, in the love of Christ Jesus. I like being free. We love freedom because it is our natural correct state under God. God created us with free will, so we could choose freely, whether we do good or evil. And given a complete and utter choice we tend toward good. But when laws and rules upon rules are forced upon us, ironically, we often tend toward misconduct, if only to show our own independence. Godly men founded this nation, the United States. We know that God blessed this nation, because it has prospered. Some might teach that the American Revolution was unholy, but if it was, why would it have been blessed by God? Considering the odds the founders had to face, fighting the greatest army the world had ever known, the British army, how could they have prevailed without God's blessing? Some might say that we should stand at attention before our governments and submit to everything they say. This isn't what the Bible teaches. The Bible teaches that we ought to obey, but disobey if it interferes with our service to God. The Bible doesn't teach us to ignore what our government does. It doesn't teach us to sit idly by. Since we have a participatory government, we ought to engage in it. If we see laws that are unjust we change them, but we need not disobey them, unless they harm others or ourselves directly. you are my glory and the one who restores me. I awoke, for the Lord protects me. who attack me from all directions. you show favor to your people." For several years I was concerned that knowing the United States was starting to resemble, and now very clearly does resemble a modern day Babylon, should I not leave? The Babylon described in Revelation is often accompanied by pleas to "flee Babylon!" Should I prepare my family and leave? It's a tough question. But I take some solace, that in the Old Testament Babylon conquered Jerusalem. This was the ancient Babylonian captivity. Almost a million Israelites were enslaved and taken to Babylon. Later on, a Persian king conquered Babylon, and allowed the Israelites to return to Jerusalem. 50,000 Israelites returned to Jerusalem, and God blessed them. The vast majority chose to stay in the wicked kingdom of Babylon, and God blessed them as well. We who remain in the United States can minister to the corrupt masses. We can wake them up to the truth of Jesus Christ. And I believe God will bless us on that quest. As many have said, there is much work to do. Let me remind and encourage you to pray. Pray when you're frustrated by the media cover ups. Pray when you wish for sleeping people to wake up. Pray when you feel frustrated. Pray when you feel lost. And pray when you're scared for your nation. God is not deaf. God hears us. God is REAL. Most importantly, God is love. He is pure mercy. He is not the mean monster that you've been told about. He's a loving God. A pure God. A God with you in the room you read this in, right now. He's there. Right now. Listen for him. Watch for him. I know, it's hard to work through the science brainwashing of public indoctrination, education, whatever you'd like to call it. Please don't mistake me, science and medicine have assisted us greatly on this journey called life. Scientists wonder at the power and majesty of the universe. I deeply respect that. I deeply respect their search for truth. I firmly believe however, that God is at the end of that journey. Some of us see the presence of God in our experiences. Some of us see it in the facts. Neither way is wrong. So we know what to do, don't we? 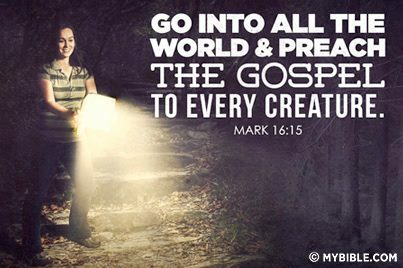 Matthew 28:16-20 says "
The great commission is ours to fulfill. And we can fulfill it. We can fulfill it every day. So please, don't be afraid as you're out there fighting for the truth. How many times does the Bible tell us to not be afraid? I know many Libertarians believe the Bible is a work of indoctrination meant to control us. I don't see that within the actual pages of the Bible. Maybe that's what is preached at many churches. But within the actual pages of the Bible, I see a path of true and perfect peace. I see a path where fear and doubt has no place. How can such a beautiful teaching of peace be indoctrination? If it were indoctrination, it would tell me to serve the state as number one, it would tell me to be afraid and to be uncertain. It would tell me to serve myself, not others. Instead, it tells of loving and caring for others, for peace and truth, for serenity and love. This is no work of indoctrination. Of course interpretation can lead to indoctrination, which is why we must read the Bible for ourselves. We must see the truth, from our own unique perspective. Remember, that we have an enemy out there. That enemy is Satan, and his followers. They are Satan worshipers, many masquerading as Jews, who quietly control the governments of the world through banks. I don't have to tell you, most of you already know this. Don't let this trouble you. We are to expect great troubles in the world. But final victory will be ours over these Satanists. Revelation 3:9 says "I will make those who are of the synagogue of Satan, who claim to be Jews though they are not, but are liars--I will make them come and fall down at your feet and acknowledge that I have loved you." Always remember, while you're out there fighting for the truth, the truth that is God given, and liberty, the liberty that is God given, remember this: You're savior Jesus Christ has already won.